Emergency Planning. It’s not all about bunkers, canned food and the zombie apocalypse. Emergency planning also means considering a number of what if scenarios and applying them to your own situation, especially if you’re a solopreneur. You’re an online seller, you get sick or have an accident and you’re laid up in hospital for a week. What happens to your business? Who can contact your customers to let them know their orders will be late? Do you have a back up plan and someone who can jump in and run things while you’re on the sick list? Is there someone who can put your site in holiday mode while you’re out of action? You can swap out online seller for any solopreneur business like freelancing or consulting, where you are the heart and soul (and muscle) of your business. The recent death of my ex-husband from Melanoma (you can read more about that here) has made this issue personal for me. 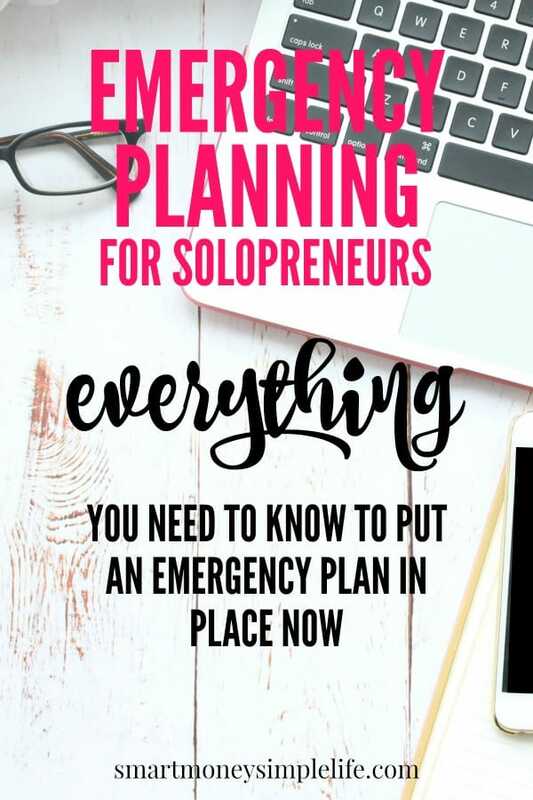 I’ve been a solopreneur for a number of years now but it was only his death that made me sit back and really think about what might be missing from my own emergency plan. Turns out, there’s a LOT missing. All the basics are covered in my will. It’s the every day stuff that I never considered. All those questions above… They hadn’t even entered my mind! They have now. Create an emergency plan manual for your business. One of the first things you need to do to create your emergency plan manual is to document your daily tasks; what you do, when you do it and how you do it. This includes everything from how to know if there’s an order waiting to be processed through to what to include with the order and how to ship it. If you’re like me, this is stuff you no longer think about, you just do it. If you’re getting a loved one to take the reigns of your business while you’re ill, to them, it’s all new and a little bit frightening. The simplest way to do this is to track your day. Note down everything you do for the day including all the steps from logging on to your site through to how to wrap parcels ready for dispatch. Worst case scenario, winding up your business. Take the guess work out of as much as possible like including proforma emails advising clients and customers of the situation and what they can expect. If you’re a freelancer, make sure someone knows where your work schedule can be found and include your clients’ details so they can be contacted and advised of the situation. The specifics might vary depending on the type of business you’re operating but the list above ought to trigger more ideas of what is important information for your business. Remember, keep the information clear and concise. Creating an emergency plan is vital but you also need to nominate a person to put that plan into action for you. Choose someone you know will be able to handle the tasks involved easily. If your business is online, choose someone familiar with the online world, not your elderly mother who has trouble using an ATM. The people close to you will be in crisis mode. Don’t add to their woes. The whole point of this exercise is not just to care for your business but also those closest to you. If you have a virtual assistant, you could delegate all the basics to them to complete. A trusted friend or family member could handle the rest. Whomever you choose, make sure they not only know ahead of time that you’d like them to handle this for you but also walk them through your emergency plan so they’re comfortable with what’s being asked of them. It’s a lot to ask so make sure you give them the option to say no. Your emergency plan will take some effort to put together. You want to make sure that work never goes to waste. Once you’ve completed your emergency plan, make a couple of copies; a back up digital version and a hard copy manual placed in a designated file or folder in your filing cabinet or on your bookshelf. And, most importantly, make sure your designated backup person knows where to find them. It might seem like overkill, but trust me, your emergency planning efforts will be appreciated by those who have to step in to take control of your affairs (as well as your customers) if something goes wrong. Are you a solopreneur, full-time or as a side hustle? Have you put together an emergency plan for your business? First of all, I want to say that I’m so very sorry for your loss. I can’t imagine losing my husband, although we came close last year. Thank you for this great post! As a solopreneur myself, all of these tips are invaluable. Until now, I never thought of creating an emergency plan for my business, which is a gaping hole in my on-going emergency preparedness planning. We lost our home to a wildfire in 2007 and ever since, I’ve been a big proponent of emergency planning from a personal perspective. But, I neglected planning for my blog! I guess it never occurred to me because I’m the only one working on it, but that was very short-sighted of me! Thanks for bringing this critical step front-and-center for all solopreneurs! It’s an area of business planning I’d let slide for a number of years, too. Not any more. The other bonus? A holiday might finally be possible! Good luck with your emergency planning.